On this site I'd like to present you the lecture I gave at the APP symposium, Utrecht, May, 25th, 2001. I presented a dutch version several times for amature groups. The dutch version was also published in Grondboor & Hamer 55 (4). A follow-up of that article was submitted for Grondboor & Hamer in October 2003, a small english version is also presented on this site as an epilogue. The references of both are combined. Although my main topic of study are Santonian to Danian corals, my interests are broader than only that specialisation. It is therefore that when the opportunity arose to take a look at a temporary outcrop of a petrified forest I did not think twice to take my camera and go. Before I share my impressions, I would like to thank Michiel Dusar and Pieter Laga from the Belgium Geological Survey, Freddy Damblon from 'Institut Royal des Sciences Naturelles Belgique' in Brussels and Johan van den Burgh and Han van den Konijnenburg from Utrecht University for their support. The construction of the TGV Brussels - Liëge - Köln along the existing motorway E40 lead to some very interesting outcrops near the interchange Tienen-Hoegaarden. One of these sections, officially called the Goudberg section, is NW of the interchange. It shows a Thanetian petrified forest, as well as some interesting sedimentary and tectonically features that help to reconstruct the local geological history. The Tienen formation occurs at the bottom of the section. It consists mainly of coarse white sand layers intersected by finer black or brown sands sometimes with peat. At the top of the formation is an about 30 cm thick peat layer in which the tree trunks of the silicified wood are embedded. Synsedimentary structures, like loadcasts and water escape patterns are visible. Sometimes the sands are kitted into sandstones, which were excavated in the neighbouring Overlaar and used as building material, although its quality was not superb. In Tienen are some old churches containing this sandstone. The Kortrijk Formation is the second unit from down to up. It consists mainly of blue-grey clay ( the so called "Ieperse Klei") to fine sand (the grain size I measured). The Brussels Formation is a formation with coarse often edgy quartz, feldspar and glauconite. Its contact with the Kortrijk Formation is erosive. In the NW part of the section the Brussels Formation has even eroded into the Tienen Formation. Therefore some tree trunks from the petrified forest are found in the Brussels Formation. Pleistocene loam covers the underlying Paleogene sediments. The Tienen Formation is a river deposit. A bulk of river sand is dumped. The river displaces a bit and finer sands are deposited. A layer with organic content is formed. A new bulk of sand enters the place and pressed the water out of the underlaying sands leaving the typical synsedimentary structures. At the Goudberg section three of these cycles were visible. The last of these cycles has the thickest peat layer. This one is formed by the petrified forest. 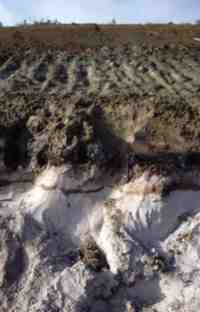 The sands just below are bleached by the acids arrived from the peat layer. Locally the sandstone of the Tienen Formation is so much enriched with iron that hematite cristalisation occurs. A NE-SW fault is clearly visible with a dip of less than a meter to the NW. It is probably of the same date as the Brussels Formation or somewhat younger and is supposed to be formed by an earthquake of at least 6 of Richter's scale. (Sentubin et al, 2000). As said before, at the top of the Tienen Formation is a peat layer in which tree trunks are preserved and silicified. The silification of this wood is probably due to the peat-clay layer which will have functioned as a barrier between the waters in the Tienen Formation and the Kortrijk Formation. This causes the necessary electric potential to secrete the silica gel on the cell walls of the wood. The preservation of the trunks found in the Brussels Formation are different from those in the Tienen Formation. The latter are more brittle and are more difficult to excavate in one piece. 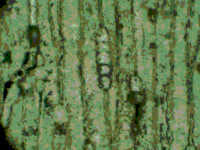 Tree trunks are present in autochtonous position each five to ten meters. Some longer stems are found laying in the peat layer and roughly SW-NE oriented. All the trees are regarded to be from the same species. The trunks vary in diameter from 50 to 75 cm. The year rings are very thin: 2 to 3 in one mm, so some of the trees must have lived more than a thousand years. Its wood suggest a Taxodiaceous gymnosperm. The peat layer contains a lot of leaf impressions. A temporary outcrop and what next? First and for all trains will be going over it. A Geo-park is planned in a amphitheatre shaped hole. In it excavated tree trunks will be on display. A bicycle road will come along this monument, so that tourists will be able to see it. Scientists in Brussels and Leuven have excavated some trunks and they are working on a publication . Naturalis got some material among which one trunk that is on display in their Natuur Informatie Centrum. 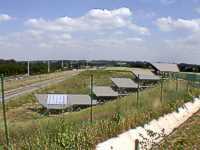 "Geosite Goudberg" was officially opened for public on June, 20th, 2003. The "Vlaamse landmaatschappij" presents a pdf file with dutch information on the site. 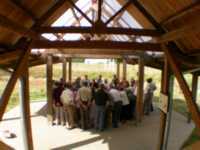 Groups can visit the site after contacting the Tourist Service of Hoegaarden (tel. 00-32(0)16-76.81.86. During the summer months the geosite will be opened for individual visits in the weekends. Fairon-Demaret et al. (2003) have described the wood of the site as Glyptostroboxylon sp.. Taxodioxylon and Glyptostroboxylon are very closely related, probably even identical generic formtaxa restricted to the secundary xylem of some taxodiaceous gymnosperms. Further research on the type specimens and on the variability within the type localities is neccessary. A more precise dating of the petrified forrest was also given: depending on which date is accepted for the Paleocene/Eocene boundary, the forrest is about 100 ky younger, so let's say that the forest grew about 54.9 million years ago during the hottest time in the Cenozoic. Heirman, W., 2002. Kwarts in versteend hout van Hoegaarden  Geonieuws. 27: (1): 12-24. Houthuys, R., 1990 Vergelijkende studie van de afzettingsstruktuur van getijdenzanden uit het Eoceen en van de huidige Vlaamse Banken  Leuven University Press, Aardkundige mededelingen 5. Sintubin, M. , P. Laga, N. Vandenberghe, I. Kenisi & M. Dusar, 2000 Different types of deformation features in the Paleogene sands in the Hoegaarden area (Belgium)  Geologica Belgica 3 (3-4).